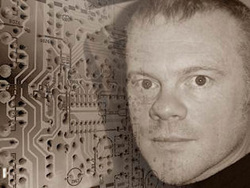 Divine Matrix is the latest project and pseudonym of electronic musician and producer Steve Barnes. Steve is a veteran of the dance music scene and has worked under many different guises and names. He first signed to legendary London dance label " KICKIN RECORDS " back in 1992 and since then has had his music released on SLIP N SLIDE, NICE AND RIPE, SUN UP, MINISTRY OF SOUND, BLACK HOLE to name but a few, remixing and collaborating with artists as diverse as Paul Van Dyke to Miriam Makeba and Emerson Lake and Palmer. In the late 90's, he joined forces with legendary house producer Grant Nelson to form successful hard house and trance label CASANOSTRA for which he wrote and produced every release under a string of aliases. He was responsible for the seminal trance track " CHURCH OF RA " written under pseudonym" DIGGER" which was described by MIXMAG at the time as "the perfect trance record" and is now widely regarded as a classic of the genre , eventually going on to feature in the soundtrack of Hollywood thriller "ONE WAY". After an absence of nearly a decade in which he has been persuing other interests and starting a family, Steve has matured as an artist and has decided to return to what he does best, writing and producing electronic music. Divine Matrix promises to be his most interesting and innovative work to date.